The purpose of this qualitative case study was to examine changes in preservice teachers’ beliefs about technology integration during the student teaching semester in USA. This study used in-depth interviews, review of documents, and observations. The findings indicated the preservice teachers’ beliefs about technology integration changed in two directions. 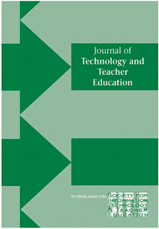 Although changes may be attributed to cooperating teachers’ practices about technology integration, this study suggested that cooperating teachers’ modeling does not necessarily lead preservice teachers to change their beliefs about technology integration in a positive way. Thus, this study suggested a need to build reflective activities for preservice teachers to gain access to the cooperating teachers’ thinking process in the modeling process. Hsu, P.S. (2013). Examining Changes of Preservice Teachers’ Beliefs about Technology Integration during Student Teaching. Journal of Technology and Teacher Education, 21 (1), 27-48. Waynesville, NC USA: Society for Information Technology & Teacher Education. Retrieved April 23, 2019 from https://www.learntechlib.org/primary/p/40463/.